Recently blogger Martin Rundkvist at Aardvarchaeology asked his readers to write a little something on the nearest archaeological site they´re aware of. Often we don´t realise just how close these sites often are – they´ve integrated themselves seamlessly into our everyday landscape and we don´t classify them as anything special at all. And archaeological sites are supposed to be special, right? Well, working as the systems manager for Sweden´s archaeological sites and monuments system I guess I might have an unfair advantage when it comes to finding known sites, but this post is about a registered site that eluded me when I searched for it and serendipitously (yes, you´re right I have waited for the opportunity to use that word…) found when I didn´t look for it. We at the National Heritage Board call it Danderyd 114:1, but locally it´s known as “Calles klimp” (Calle is a Swedish nick-name for Carl and klimp means lump in Swedish). A few years later me and my then girlfriend went to these cliffs to have a swim. So we threw our towels on a rock and jumped into the water. When we climbed up I noticed that there was something carved on the rock. As I lifted away the towels I read “CALLES KLIMP”!!! Now is this an archaeological site you might ask? 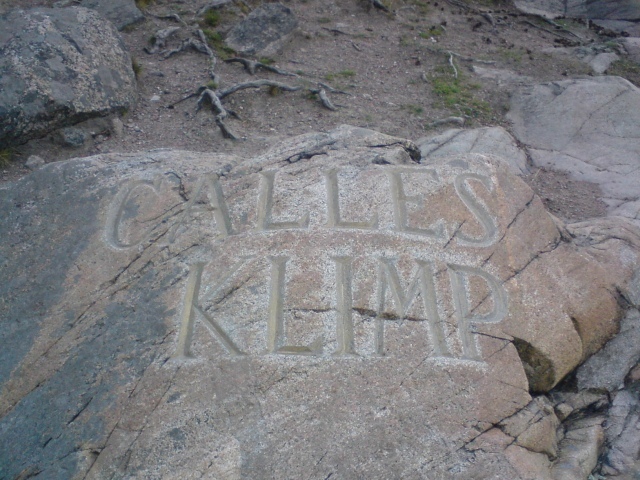 Yes, according to Swedish law rock faces with inscriptions are and “Calles klimp” is such an inscription on a rock face. Who is Calle? When were the letters carved? Was the carving considered as vandalism by it´s contemporaries? I don´t know, but the name has stuck not only on the rock, but in the minds of the locals who do call these popular bathing cliffs “Calles klimp” and the official names of the surrounding cadastral units are also named “Calles klimp”. Whoever Calle was he succeeded in marking his ownership of the rock and the place. Of course this does beg the question – when does grafitti become archaeology? Is there a contradiction in society legally protecting old grafitti, considering them as markers of remembrance and sources of knowledge, and at the same time have a zero tolerance policy against contemporary grafitti? You tell me! ADDENDUM: Some quick research (or googling as it´s called nowadays…) tells me that there are three different traditional candidates on who Calle was: King Charles XI, King Charles XII or spicemerchant and local resident Carl Peter Eneroth (1799-1854). I was in Latvia a year ago and saw a cave site where many many tourists have carved their names in soft rock for at least 150 years. Some of the best were inscriptions by German-nationalist youth clubs from around 1848-9.